This article is 367 days old. 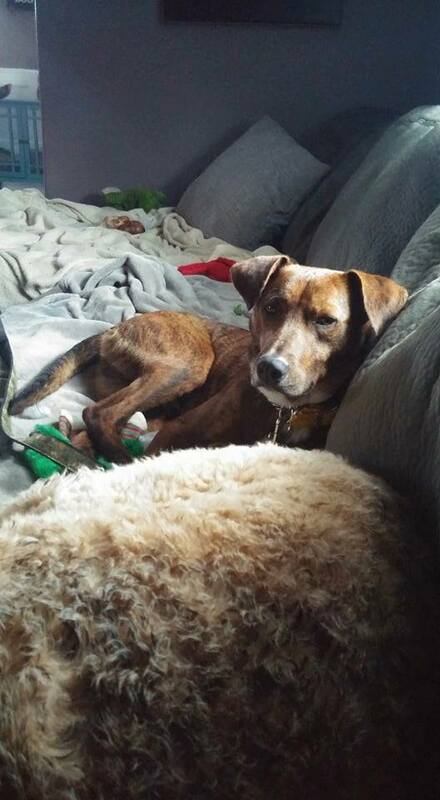 Merlin is a 9 month-1 year old Mountain Cur Mix who weighs 35 lbs. ABRACADABRA! If you could conjure up the sweetest dog it would be Merlin. He will work his magic on your heart and put you under his spell. He has had many changes recently and has developed some anxiety with new places and noises, in just a very short time in his foster home he went from terrified and anxious to a bouncy spunky little dog. He takes some time to become comfortable with new places but once he does WATCH OUT! He is a happy and very playful little guy who is so loving. He LOVES his toys and will stash them all around the house and is learning to fetch and loves it. He is still very “puppy-like” and likes to put things in his mouth so having lots of toys and some chews around will keep him away from anything he isn’t suppose to have. Because of this and his anxiety he does best in a nice comfy crate when left alone and at night at least until he has time to adjust and mature. He loves to be outside and will spend hours out there playing or just relaxing and doesn’t make a peep or get into trouble. He gets along well with dogs and would love a playful confident dog to show him the ropes. He also gets along quite well with cats, actually he loves them! so a cat who is comfortable around dogs would be a good fit. He loves his walks, he gets excited and can pull a bit at first but calms down after some time. Living in a home is still new to him and he is learning his manners and is coming along well, someone who would continue this and who is willing to do some basic training with him would be a great thing for Merlin. He is house trained and crate trained and is such a good boy in his crate, he is quiet and goes right to sleep. He will only bark when he is playing and is a little shy but very friendly when new people come to the house. In the house he will come up for some attention and snuggle up gor a nap but can also be independent and entertain himself with his toys and chews. He is still young and can be a bit wild and bouncy at times so older children would be a better fit for Merlin. He is a wonderful dog who has been through so much and deserves a loving family of his own. More information on how to adopt from For The Love of Paws can be found on their website.